It probably comes as no surprise to anyone that I do all the grocery shopping in our family. I’ll be honest, I’m not all that budget-conscious when it comes to food – as sadly, it seems the healthiest choices out there are often the most expensive. However, I have been known to stretch a food dollar on occasion. Over the weekend I took a chicken out of our freezer, with plans to roast it for dinner Sunday evening. For some reason, Scott (my husband) asked me how much I paid for that chicken. This chicken cost me $20. Scott realized that we had about 5 similar chickens hanging out in the deep freeze, and being the Math Whiz that he is, figured out that we had about $120+ in chickens hanging out in our freezer. He wasn’t pleased. So then I explained to him how these were ‘special’ chickens, pasture-raised with love by a farmer friend of mine. Hormone and antibiotic free. Not the mass-produced variety that you see in the grocery store. He still didn’t seem impressed. Then I told him out that $20 chicken would feed the four of us for dinner for 2 nights, plus serve as lunch for me for two days. That’s 10 servings from 1 chicken – which boils down to $2 a serving. Finally, the man was impressed. I should have also thrown in how I use the carcass to make stock that he’ll see in a soup or a chili somewhere down the road, but I figured I had already made my point. Sometimes what seems like an expensive choice isn’t quite that expensive when you see how far it will go. For things like meat/poultry I always try and source locally, from farmers I trust. In the short term (as in when I write the check) it seems quite expensive. But in the long run, the math works out AND I know I’ve made the healthiest choice for my family and the environment. So you might be wondering… what did I do with my $20 chicken? First I butterflied it (cut out the backbone) and marinated it a mix of whole-milk yogurt, lemon zest, shallot, garlic and a mix of herbs (I used parsley, thyme and oregano). I did this early in the morning so it would be nice and flavorful by the time I roasted it in the afternoon. Here’s what he looked like coming out of the oven. Sorry for the bad pic, but I snapped it with my iPhone. 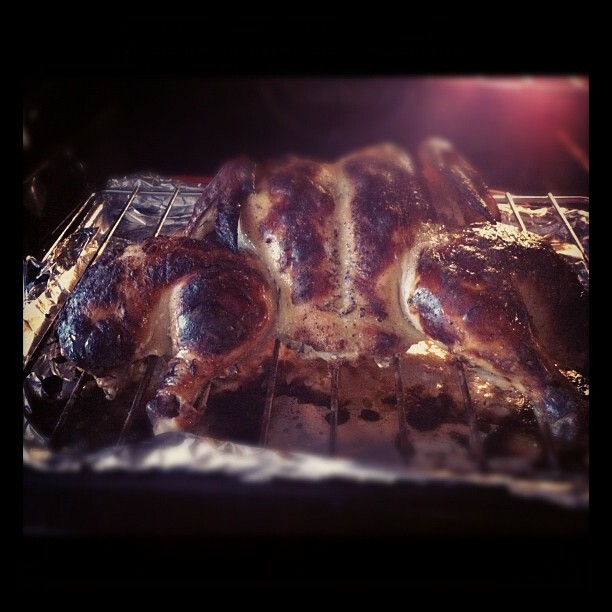 The best thing about butterflying a chicken is that even a big one like this (6lbs) roasts in just over an hour. For dinner I served it with rice pilaf and sauteed asparagus coins. 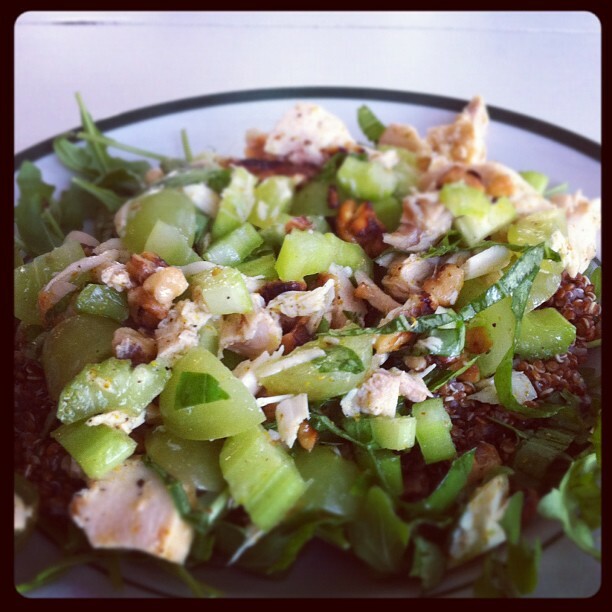 Today for lunch, I took a little bit of the leftover chicken and made an outstanding salad with quinoa and arugula. Here’s a link to the recipe I used. I have enough probably for two more lunch servings. And for dinner tonight, I’m going to toss the remaining chicken with our favorite BBQ sauce and we’ll have BBQ chicken sandwiches with some coleslaw, roasted potatoes, and corn.